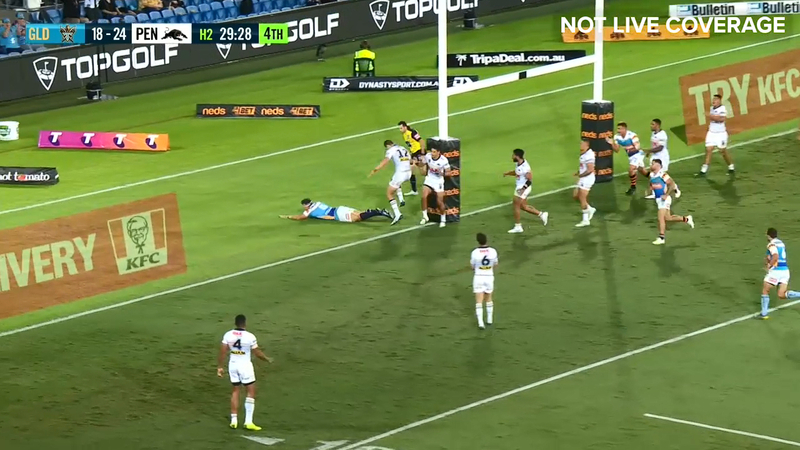 The Titans have recorded their first win of the 2019 season with a gallant 30-24 win over the Panthers at Cbus Stadium. In the end, it was a contentious penalty try which split the difference on Friday night as Bryce Cartwright was deemed to have been obstructed on his path to downing Dale Copley’s break and kick in the 66th minute. Panthers skipper James Maloney made his protestations known, but it was too little too late as the heat was turned up in the dying moments thanks to an all-in scrap when Dallin Watene-Zalezniak appeared to have been grounded by a vicious shoulder charge. It was the visitors who got off the blocks quicker on Friday night, but the Titans refused to roll over consistently asking questions of the Panther’s at times pedestrian defence. Points had deserted the Titans in four losses to start the season but they piled them on in Robina to ease the pressure on coach Garth Brennan and restore some faith after the club's worst start to their campaign. They weren't denied a second time, Dale Copley's chip in behind looked good for a try before Tyrell Fuimaono tackled Cartwright without the ball. The fact Cartwright couldn't ground the ball cleanly meant it was a penalty try, allowing Michael Gordon to slot the points from in front in his 250th NRL game and leave Penrith with a 2-3 to start the season.